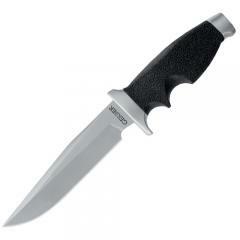 Be prepared to handle the worst life can throw while carrying the Steadfast Plain Edge Fixed Blade Knife from Gerber. Built with the unrelenting strength users have come to expect from the name Gerber, the knife features a solid steel full tang construction that delivers unparalleled durability. By eliminating weak connection points and unnecessary hinges the knife can cut, hack and pry without fear of a snapped blade. The steel handle is fitted with a SoftGrip overmold and is anatomically shaped to match the exact contours of the palm for extreme comfort during long jobs. Precision machined finger grooves add to the knife's smooth handling capabilities and offer supreme retention capabilities regardless of weather.